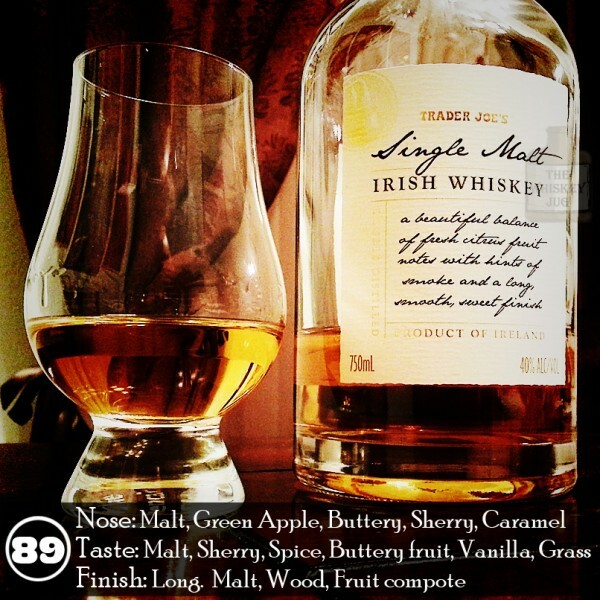 Trader Joe’s Single Malt Irish Whiskey Gets An “A”! The Trader Joe’s Single Malt Irish Whiskey is delicious. If you’re reading this review on your phone while trying to decide if you should buy it or not the answer is yes. The thing you’re hmming and hawwing over is delicious and at only $20 a bottle this Cooley made beauty is a frigging steal. Put your phone back in your pocket and grasp that bottle before you with both hands and take it to the Hawaiian shirt clad cashier immediately. That said, I’m always a little weary of private label booze. They almost never say on the label who really makes them and so it’s a bit like Forrest Gump’s box of chocolates. Every time I see a private bottling I automatically think that it’s the worst of the distiller’s stock rolling around in the bottle and that’s why they didn’t slap their own label on it. Sometimes I’m right, sometimes I’m wrong and this time… I am wrong.